Seafood of the Pacific Northwest meets the cuisine of the South. : Eric Donnelly named his two-level former warehouse in Fremont after his favorite fly-fishing stream in Montana. Transforming the spot into an inviting space, he filled the rooms with a mix of reclaimed materials and sleek, modern fixtures. 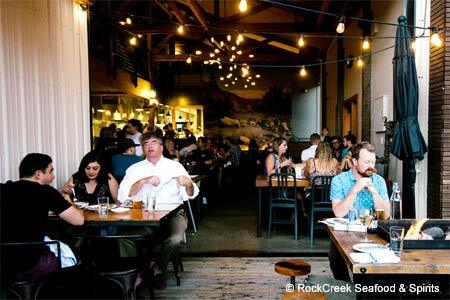 On RockCreek’s ever-changing lineup of small plates and shareable mains, seafood gets star treatment with an extensive selection of fin fish sourced from near and far. Start with a well-crafted cocktail before diving into a dozen pristine oysters from Eld Inlet in the South Sound. Brandade, a classic potato and cod casserole, will warm the chilliest winter evening, and a crab-stuffed chile relleno turns the heat up another notch. Not to be missed is the Icelandic char floating on a mustard beurre blanc, or the oil-poached albacore caught in Puget Sound. Turf fans will cheer the kitchen’s skills in turning out crisp roast chicken and the Niman Ranch prime rib-eye alongside buttery fingerlings. Count on your polished server to make astute pairing suggestions from the eclectic wine list. While it might be tempting to order one of everything on the savory side, save room for an order of ricotta-rich beignets, a deluxe version of the fried dough made famous in New Orleans and served here with a crème anglaise dipping sauce.